A strong chest improves the overall physique of the body and is imperative that one should work stepping-up the chest. The chest could be improved using barbells, cables, and dumbbells. In this article, we take a closer look at the chest workout tips one could perform using dumbbells. Working with the dumbbells is highly versatile as it ensures better control and superior customisability during the training sessions. These work on multiple levels ensuring enhanced inter-muscular and intra-muscular movement for better muscle activation and control. Targeting the chest region with dumbbells and an incline-decline bench allows the user to work on their muscles with elevated levels of adjustability and higher levels of precise control. In addition, the variation of inclination angle aids in shifting the focus on various muscles groups. Let us shed some light on the five best chest workouts involving dumbbells that you could add to your workout routine to build a strong and a robust chest. The dumbbell press is quite basic and is easy to perform, making it an ideal activity for amateurs and casual trainers. The exercise works on chest muscles with precision. Moreover, it is a great exercise for building upper arms and shoulders. It is traditionally performed on a flat bench, but variations are also seen using incline benches for variable resistance. Step 1: Hold the dumbbells with palms facing away from the head and bent elbows. 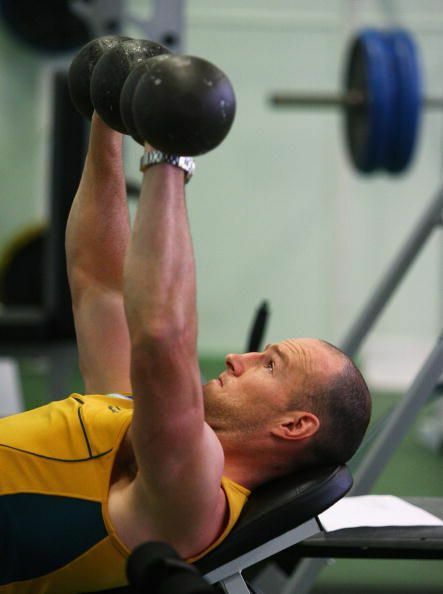 The dumbbells should be held just above the torso on the sides. Step 2: From the initial position, slowly move the arms in upward motion such that the arms are almost straight. Care should be taken that the lift is only performed using the chest and there is minimal movement from the lower parts of the torso. Step 3: Hold the dumbbells in this position for a moment and then return to the starting position. Repeat the exercise for the recommended number of times. Important tip: Keep in mind that the time required to lower the dumbbells should always be longer than the time required to lift the dumbbells from the starting position. Moreover, be careful not to drop the dumbbells in rapidly as it could damage the shoulder and the rotary cuff.